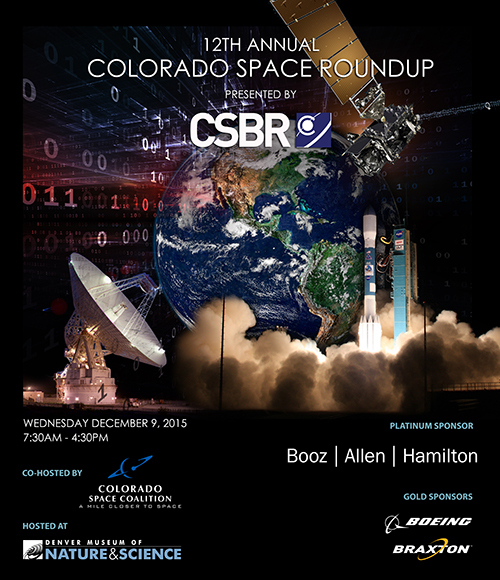 November 5, 2015 – Registration is now open for the 12th annual Colorado Space Roundup, to be held at the Denver Museum of Nature & Science on Wednesday, December 9. Colorado Space Roundup is co-hosted by the Colorado Space Business Roundtable and the Colorado Space Coalition. It’s structured as a full-day conference with four roundtable discussions, a keynote luncheon speaker and ample time to meet and mingle with CSBR members and participants. Many participants say this is the one event they never miss because of the important business connections they make each time they attend. This is the 12th consecutive year the Colorado Space Roundup will bring together thought leaders from the commercial, private, academic and government sectors to discuss industry challenges and opportunities. This year’s Roundup is designed to spark an open and honest assessment about the current state of the aerospace industry. Colorado is an industry leader and looks forward to continued success in the coming year. This year’s luncheon keynote speaker is Thad Allen, Executive Vice President of Booz | Allen | Hamilton. Allen is a leader in the firm’s business at the Departments of Justice and Homeland Security focusing on emergency management, critical infrastructure protection, cyber security, emergency communications, and maritime security. He is a national thought leader in homeland security, maritime policy, law enforcement and national resiliency. Please register online for the Colorado Space Roundup.